More than 50 skills are covered on 5 DVD’s in this Nursing and Nurse Aide Training video series. Learn the proper way to provide nursing care from nurses on real people, developed by nurse educators. This complete training package utilizes close ups, slow motion and extensive explanation on the importance of proper technique and body mechanics to enhance patient care outcomes while keeping caregivers safe. This series comes complete with a binder full of additional leaning materials including quizzes and skill assessment tools. The Nursing and Nurse Aide package is divided into 13 easy to follow, color-coded modules. Each module contains a competency quiz that may be used as a pre/post test. Customer Service (2 videos) – Entering and exiting a room skills are reinforced. Infection Control (5 videos)- Skills to prevent the spread of infection are demonstrated. Safety (2 videos)- General safety and body mechanics are addressed. Vital Signs (7 videos)- View the collection of vital signs including TPR, BP, weight and pain. Mealtime Assistance (2 videos)- Caregivers assist with mealtime and record intake. Mouth Care (4 videos)- Oral care, and denture placement, removal and cleaning are demonstrated. Perineal Care- Female (3 videos)- View proper techniques for cleaning female patients in the bed, shower, and in the bathroom. Perineal Care- Male (5 videos)- proper techniques for cleaning female patients in the bed, shower, and in the bathroom are demonstrated. 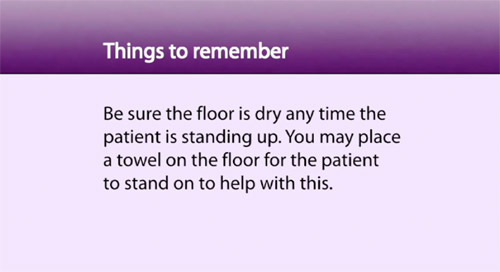 Toileting (4 videos)- Observe assistance with the bedpan, toileting, catheter care and measuring output. Bathing (3 videos)- Full shower, tub bath and bed bath are demonstrated. 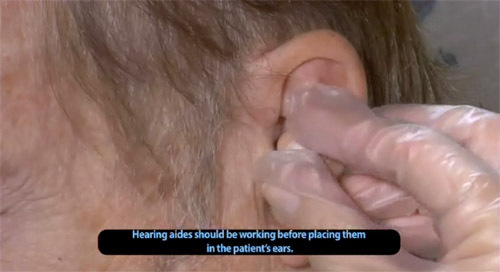 Personal Care (6 videos)- A variety of personal cares are reinforced including occupied bed making, foot care, nail care, elastic stocking placement, dressing and hearing aides. 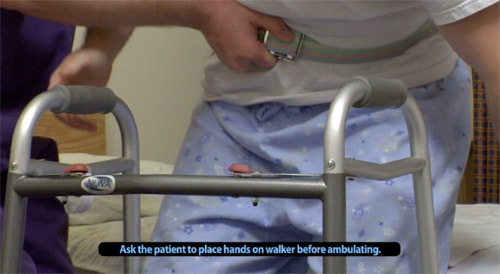 Ambulation (2 videos)- Patients are assisted to ambulate with and without a walker. Transfers (9 videos)- A compilation of transfers from the bed, toilet, shower chair, and tub all reinforcing proper body mechanics.